Looking at the bow of the boat. 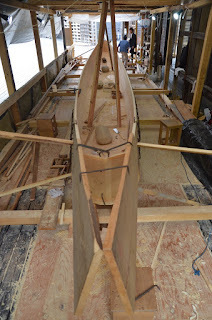 Here a short pair of planks act as an extension of the top plank to support the forward deck. 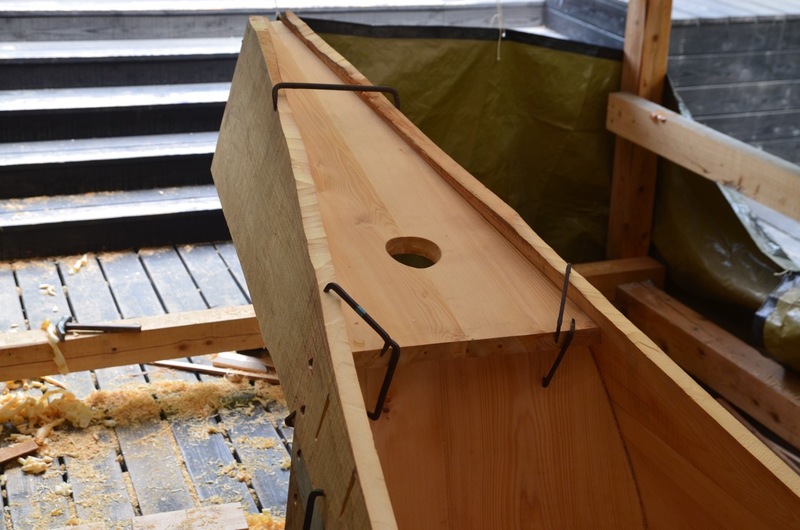 The basket containing firewood, used to attract fish, sets in a hole in this deck. 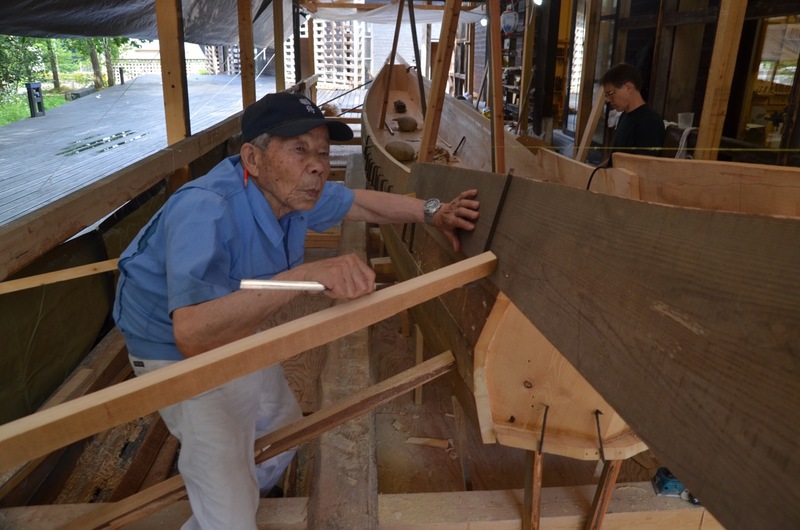 Our top plank, called the koberi, runs past the boat aft forming the support for the aft deck. This is the smaller of the two decks on these boats. Barely visible is a string Nasu ran to find the height of the forward deck. He attached it to a known point at the sheer at his first station and then measures a memorized height where the string passes the transom. 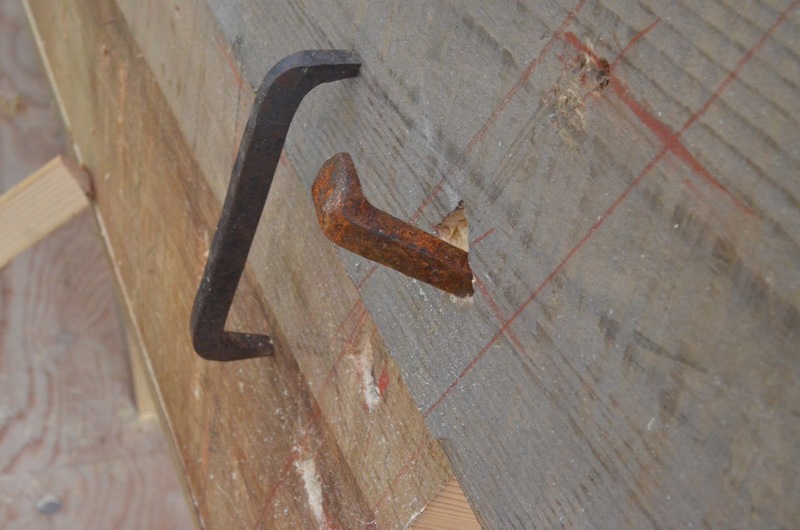 These are the umbrella nails used to fasten our planks to the transoms, as well as the garboard to the bottom. 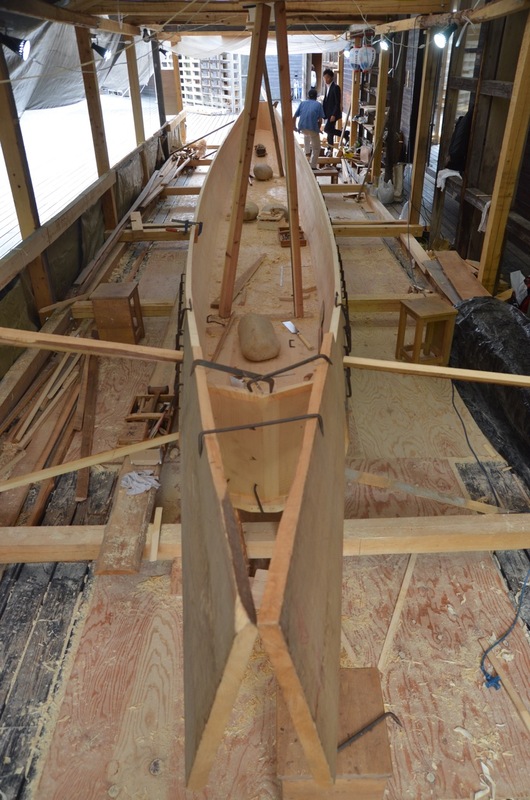 The heads are angled which nicely matches the slope of the planking. As far as I know this is the only region in Japan where boatbuilders used this type of nail. 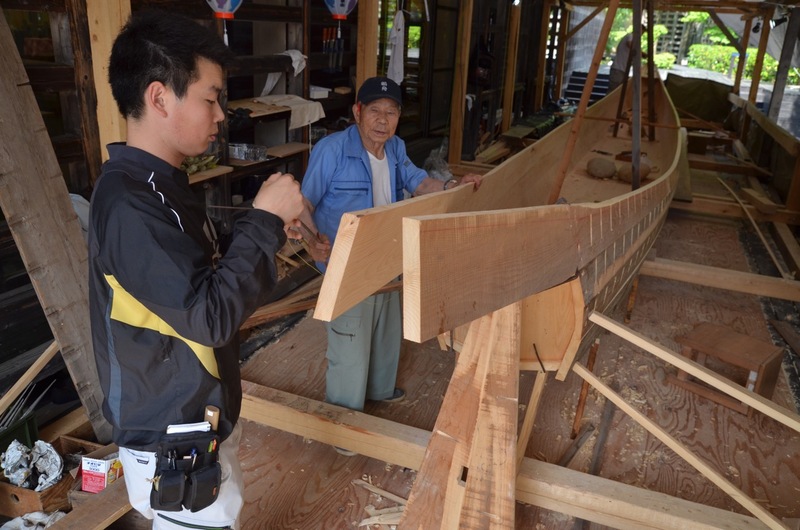 Satoshi Koyama, a furniture student at Gifu Academy, helps Nasu san with the layout of the planks aft. 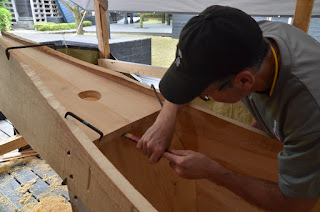 Here I am fitting the forward deck to the top of the transom using a narrow saw. The deck consists of two planks edge-nailed together at a slight angle. 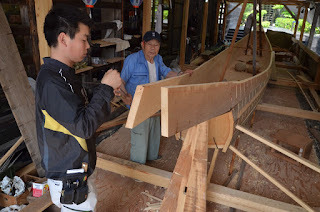 Nasu san told us to keep the bottom of the deck rough in order to provide a good environment for spiders, which he says are the emissaries of the river god. We also left the interior of the plank rough where it extends forward of the transom. 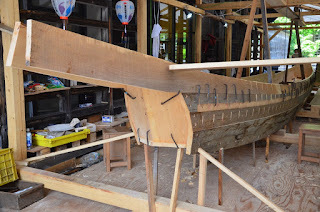 We left for a week in Okinawa to see the annual sabani race (see next post) and while we were gone Nasu san's daughter and mother had a makihada workshop, showing people how to make traditional boat caulking from the inner bark of the maki tree. This link to the Whole Wasen Catalog has photos and explanation. 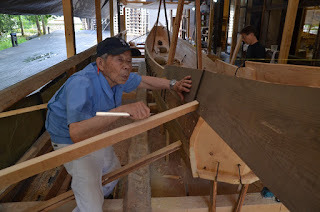 I am very excited about this website, made by one of the members of the Wasen Network, a mailing list I helped to form, hopes to become a clearinghouse for information about traditional Japanese boatbuilding.